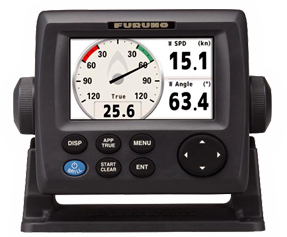 The RD33 is a navigational data organizer that allows the operator to select the perfect way to display data from interfaced equipment such as GPS, chartplotter, radar, fish finder, autopilot, instruments and other sensors including engine information. The high contrast, color 4.3" LCD may be installed in a compact space, remote from its sources. The screen is impressively bright, remarkably crisp and easy to read. Various display modes are available including Speedometer, Highway and Text. The text mode presents up to six of the most necessary types of data. The display layout can be customized for your specific needs. This versatile product can also be added to a NavNet system, displaying a variety of navigation data from the CAN bus network. Bridge the data gap with style! Because the RD33 is a capable NMEA0183 and NMEA2000 device, you can use it to bridge both data formats and output the information you desire, in whatever format you desire, to the rest of your onboard network. The RD33 communicates over a NMEA0183 or NMEA200-compatible CANbus network. CAN bus is a communication protocol that shares multiple data and signals through a single backbone cable. You can simply connect any CANbus device into the backbone cable to expand your network onboard. With CAN bus, IDs are assigned to all devices, and thre status of each sensor in the network can be detected. All CAN bus devices can be incorporated in the NMEA2000 network. More than just communicating in the format you want, you can customize the display to view the information in the format that works best for you. Displaying a wide variety of numerical and graphical data in easy-to-read formats that you can see from a distance is the key to organizing your onboard information. With the RD33, you can customize the displays to show large numbers or, if you prefer the look of traditional analog guages, you can display those as well. You can even split the screen in up to six separate segments. You decide what information is important to you, and that’s what you’ll see with every glance. The RD33 packs a big punch when it comes to avoiding Information Overload!